Two wars and "Postwar Management"
One of the national goals of Meiji was military expansion. To be more precise, Japan felt the need to create an area of influence around its territory to protect its interest against the West. During Meiji, the greatest potential threat to Japan was eastern expansion of Russia (Romanov Empire). To guard its national interest, Japan wanted to construct its "line of interest" beyond its national border. That specifically meant placing Korea under Japanese influence. "There are two ways to secure national independence and defense. The first is to protect the line of sovereignty. The second is to protect the line of interest. The line of sovereignty means the nation's border and the line of interest includes the area closely related to the safety of the line of sovereignty. There is no country that does not try to defend both lines. Under the present circumstance, to maintain our independence and stand against the Western powers, defending the line of sovereignty is not enough. We need to protect our line of interest as well." 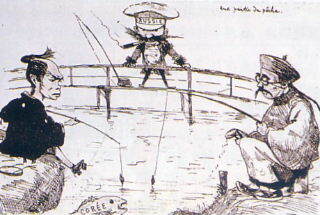 A French caricature depicting Japan and China trying to catch a fish (Korea), while Russia looks from the sideline. But China (Qing Dynasty) considered Korea as its protectorate. Japan's ambition over Korea naturally clashed with the Chinese interest. In Korea, the political situation became unstable with the military provocation and the assassination of a Korean queen by the Japanese troops as well as by coup attempts. Finally, Japan and China opened fire over Korea (Japan-China War, 1894-95). Japan's new battleships and military strategy won over China's older method of fighting. Although Chinese equipment was also modern, its strategy was poor. After this victory, Japan obtained reparation (310 million yen in gold), Taiwan (Japan's first major colony) and Liaodong Peninsula. But Japan was forced to return Liaodong Peninsula to China under the joint pressure from Russia, Germany and France. Japan felt deeply humiliated at this because it meat it was still a power weaker than the West. After the Japan-China War, Korea and the Northeastern region of China remained under Russian influence. This inevitably collided with Japan's expansionist policy and, within ten years, the Japan-Russia War erupted (1904-05). Most foreigners predicted Russia's easy victory. 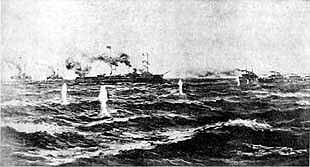 But surprisingly, the Japanese navy decisively defeated Russia's Baltic Fleet. Immediately after this spectacular naval victory, the Japanese government asked the United States to mediate a peace treaty (Japan would face a fiscal crisis if the war continued). The victory over Russia was considered to be a strong signal that Japan finally became a first-class country on a par with the West. National pride ballooned. But at the same time, the people and the media were infuriated because Russia paid no reparation. By contrast, the Japanese government was happy just because the war ended before Japan went bankrupt. 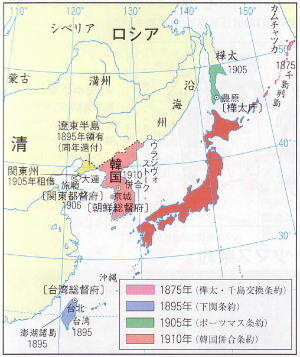 Japan annexed (that is, colonized) Korea in 1910. Russia's Romanov Empire collapsed in 1917 and a communist regime was established instead (Russian Revolution). What impact did the two wars (Japan-China and Japan-Russia) have on Japan's macroeconomic policy stance? To consider this, we need to look back a bit. 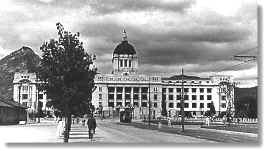 When the first imperial parliament opened in 1890, the key issue was fiscal expansion versus fiscal austerity. The government wanted to accelerate spending for industrialization and military buildup, but the opposition parties demanded tax and spending cuts. This reflected the voice of voters most of whom were rich farmers who had to pay the land tax. But gradually, some opposition parties changed tactics and began to cooperate with the government, asking for more rural public spending (in their constituencies) rather than fiscal austerity. During the two wars, military spending sharply increased. In the case of the Japan-Russia War, foreign bonds were floated in America and Europe to partly cover the war expense. This practically terminated the debate over fiscal policy stance: fiscal activism became generally acceptable. As a result of continued fiscal expansion, balance-of-payments pressure mounted and the Bank of Japan was quickly losing gold reserves. Thus, Japan prior to WW1 was facing an increasingly serious macroeconomic crisis. 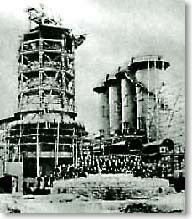 In 1896 the parliament approved the budget for building a modern state-owned steel plant. Yahata (also pronounced Yawata) Steel was completed in 1901. Initial technical difficulties were overcome by adjusting German technology to local requirements. Yahata Steel was later merged a few times to become Nippon Steel Corporation. The United Kingdom adopted the gold standard in 1821 and all other major countries (including the US) shifted to the gold standard by the end of 1870s. While the West was on the international gold standard, Japan remained externally on the sliver standard (gold, silver and copper coins were used domestically but silver was used for international trade settlements). This was mainly because the silver standard was dominant in East Asia. Shanghai (China) was the center of Asian foreign exchange markets. The price of silver gradually declined against gold in the late 19th century. This meant that the Japanese yen, tied to silver, automatically depreciated against the major currencies, which was convenient for export promotion. But Finance Minister Matsukata (the man who deliberately generated Matsukata Deflation in the early 1880s) insisted that Japan should adopt the gold standard as soon as possible because it was the standard practice among the first-class countries. Ignoring opposition, Matsukata introduced the gold standard in 1897. The initial gold reserves were secured by the reparation gold paid by China after the Japan-China War. From then on, the Japanese yen was fixed against major currencies at $1 = 2 yen. As a consequence, the automatic depreciation of the yen was terminated. Japanese inflation converged to world inflation, which was close to zero. Due to the absence of exchange risk, it became easier for the central and local governments to issue foreign currency-denominated bonds. In early Meiji, the Japanese banking system was chaotic, to say the least. The initial policy of creating "national" banks (1872), copied from the US system, was not very successful ("national" here means "nationally chartered"; these banks were actually private). This decentralized system had no central bank, and each "national" bank could issue bank notes with the backing of gold reserves. But holding gold was costly and only four banks were set up. Later, the gold reserve requirement was relaxed and more banks were created. But this system was ineffective and later abolished. The modern banking system began to take root by the creation of a central bank (Bank of Japan) in 1882, which became the only entity to issue the national currency. In addition to commercial banks, the following specialized banks were created to fund investment projects. In addition, postal savings began to collect people's savings. Insurance companies, agricultural cooperatives and SME cooperatives also functioned as financial intermediaries. An advertisement of postal saving (1891). The postal saving system was established initially in Tokyo and Yokohama only, in 1875. 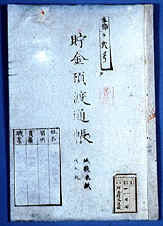 The postal saving book in early Meiji. But until late Meiji, Japanese banks were not true financial intermediaries in the sense of taking deposits and making loans. At first, the liabilities of the banks were dominated by paid-in capital, reserves and government deposits. For these early banks, designation as the government's fiscal depository was very profitable, because they did not have to pay interest on official deposits ! Only towards the end of Meiji, banks began to rely more on private-sector deposits. But even then, many banks remained unsound with little information disclosure, risk management, portfolio diversification or project evaluation. Banks were often captured by a few business enterprises, providing financing exclusively for them (such banks were called kikan ginko or "institution banks"). This caused an enormous problem of bad debt later in the 1920s (see lecture 8). The trading floor of the Tokyo Stock Exchange. All this suggests that creating a sound banking system in a developing country is a very difficult and long-term endeavor. A new banking law and financial deregulation will not be enough to achieve this. 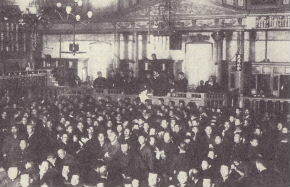 As to the capital market, stock exchanges were created in Tokyo and Osaka in 1878. But initially, few stocks were traded and the exchanges functioned mainly as a secondary market for government bonds (former samurais who lost rice salaries and received such bonds often wished to sell them due to financial distress). In the 1880s, as many railroad companies were established, railroad bonds gradually became the most important instruments for trading. In the 1890s, the shares of maritime shipping companies became popular. After 1906 when private railroads were nationalized, the shares of textile and food companies replaced railroad stocks. Where did the saving for Meiji industrialization come from? Data are incomplete, economic historians are still debating, and we do not have a definite answer. Professor Juro Teranishi (Hitotsubashi University) estimates the savings-investment balance of Japan from 1899 to 1937 (he does not have data for early Meiji, before 1899). He classifies the economy into four sectors: private farms, non-farm private enterprises, government, and the external sector. He additionally estimates the size of agricultural taxes. The following interpretation by Prof. Teranishi is consistent with his estimates (although there may be other interpretations). (1) In pre-WW2 Japan, the largest funds for industrialization came from private enterprises themselves. Retained profits, family savings, and rich merchants' funds seem to have financed private investments within the business sector through self-finance, joint stock companies and so on. The role of banks as a financial intermediariy did not seem very great, especially in the early periods. (2) In addition, the fiscal transfer mechanism from agriculture to industry must have played an important role to the extent that land taxes paid by rural communities were used to finance public investment and various subsidies. But Prof. Teranishi downplays the role of landlords as major contributors to saving mobilization (the ratio of agricultural tax to total investment declined over time). Nevertheless, such fiscal transfer may well have played a crucial role in early Meiji, for which Prof. Teranishi does not have data. (3) Foreign savings (foreign-currency denominated bonds issued by the central and local governments) played some role toward the end of Meiji. Quantitatively speaking, the contribution of foreign saving to industrialization was small during the Meiji period. Almost all necessary funds were raised domestically. Meiji Japan did not welcome FDI or foreign loans for industrialization, except for the public-sector borrowing in late Meiji for the purpose of war execution and Postwar Management, as mentioned above. Initially and as a matter of principle, the government rejected external liabilities or foreign control. This is in sharp contrast to other latecomers such as Russia and Italy. Russia borrowed heavily from London financial markets to build railroads during the 1860s and 70s. Italy also accepted large amounts of foreign investment in all sectors in the late 19th century. However, the reliance on foreign saving did increase in late Meiji. Let us see what happened step by step. In early Meiji, the government issued foreign bonds twice. After that, there was some internal debate on the desirability of further borrowing for the purpose of creating a modern monetary system. But actual borrowing was not considered until the mid 1890s. After the victory of the Japan-China War (1894-95), the situation began to change. With the introduction of a fixed exchange rate and the gold standard (made possible by reparation gold paid by China), it became easier for Japan to issue foreign bonds. The policy of fiscal activism also called for additional financial sources. Establishment of the Rikken Seiyukai Party, which strongly supported spending policy, and its assumption of power in 1900 accelerated this trend. In order to ameliorate financial crises and credit shortage, the business community also began to call for external borrowing. In the seven years following the end of the Japan-China War, the Japanese government issued foreign bonds in three installments, totaling 190 million yen (=$95 million) to fund its public investment. During the Japan-Russia War (1904-05), the government again issued foreign bonds worth 800 million yen (=$400 million) in four quick installments to execute the war (the main issuing currencies were UK pound and US dollar. Note $1=2yen; 1 pound = $4.87). Between this war and the outbreak of WW1, bond issue was repeated seven more times mainly to redeem domestic government bonds and release more funds for domestic industries. After the Japan-Russia War, local governments also began to borrow vigorously abroad. Local government bonds and corporate bonds issued by local SOEs were the two major forms of such borrowing. These funds were used for building infrastructure including railroads, gas and water supply, electricity and so on. Prof. Teranishi as well as Prof. Tsuneo Kamiyama suggest that external public borrowing can be interpreted as a way to finance the balance-of-payments deficit while continuing fiscal activism. Without it, macroeconomic policies had to be tightened but Japan did not want to do that. As to FDI (direct purchases of stocks by foreigners), inflow remained negligible. As the unfair commercial treaties were revised, foreigners were allowed to invest in Japan (not just in designated foreign settlements) in 1899. But that did not cause any increase in FDI inflow. There were only two companies in which foreign ownership exceeded 50%. (i) Industrial revolution was achieved in light industries (especially textiles) although machinery and chemical industries were still weak. (ii) Japan had a Western style legal system complete with a constitution, other necessary laws, and a functioning parliament. (iii) Unequal treaties were revised step by step and Japan regained tariff rights and the right to judge foreign criminals. Taiwan and Korea were colonized, and the threats of China and Russia were repelled. After WW1, Japan began to attend important international conferences as a member of "Big Five" (the other members were US, UK, France, and Italy). But Japan's achievement and assertiveness created new doubts among both the West and the Asian neighbors. For the West, Japan now became a dangerous military power which might imperil their interests. For the rest of East Asia, Japan now acted as a new imperial invader in the region, threatening their independence. During WW1, while Europeans and Americans were busy fighting, the Japanese government issued the "Twenty-One Demands" to China in 1915. These demands included transfer of German-occupied territories (Shandong Peninsula) to Japan, expansion of Japanese interests in Southern Manchuria and Eastern Inner Mongolia, a new industrial joint venture, prohibition of yielding Chinese territories to other countries, acceptance of Japanese advisors, and others. ["Manchuria" is a term then used for the Northeastern Region of China]. The Chinese government first resisted the Twenty-One Demands, but with an ultimatum from Japan, it finally accepted them. Later, when China's protestation against the Japanese demands was rejected at the Paris Peace Conference, a large-scale anti-Japanese movement erupted in China in 1919. After the Russian Revolution, the major powers sent troops to topple the new communist government, but the attempt was unsuccessful. Japan sent the largest number of troops to Siberia and remained there the longest, after the other countries ended intervention. These actions increased global suspicion against Japan. Even the US, the traditional ally and the largest trading partner of Japan, began to express doubts. Another big issue with the US was America's mistreatment and discrimination against Japanese immigrants in the US. During the 1920s and 30s, Japanese diplomacy faced the critical choice: whether to restore friendship with the West and East Asia, or continue to assert its way against global criticism. Japanese occupied territories prior to WW1 and the years of occupation. Liaodong Peninsular (yellow) was occupied in 1895 but returned in the same year under the pressure from Russia, Germany and France. Japan's colonial administration headquarters in Seoul, Korea. Japan colonized Korea from 1910 to 1945. Ishii, K., A. Hara, and H. Takeda, Nihon Keizaishi 2 (Socio-Economic History of Modern Japan 2: Industrial Revolution), University of Tokyo Press, 2000. Iwanami Shoten, Sangyoka no Jidai 2, Nihon Keizaishi 5 (The Age of Industrialization 2, Japanese Economic History vol. 5), S. Nishikawa and Y. Yamamoto, eds, 1990. Minami, Ryoshin, The Economic Development of Japan, Macmillan, 1986. Murakami, Katsuhiko, "Boeki no Kakudai to Shihon no Yushutsunyu" (Trade Expansion and Capital Export and Import), chapter 1 in Ishii, Hara, Takeda (2000). 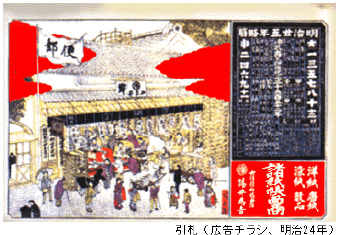 Okazaki, Tetsuji, Kogyoka no Kiseki: Keizai Taikoku Zenshi (The Path of Industrialization: History before Becoming an Economic Giant), Yomiuri Shimbunsha Press (1997). Ranis, G., "The Financing of Japanese Economic Development," in K. Ohkawa et. al. eds, Agriculture and Economic Growth: Japan's Experience, University of Tokyo Press, 1969. Rosovsky, H., Capital Formation in Japan: 1868-1940, Free Press of Glencoe, 1961. Teranishi, Juro, "Kinyu no Kindaika to Sangyoka" (Modernization of Finance and Industrialization), chapter 7 in Iwanami Shoten (1990).